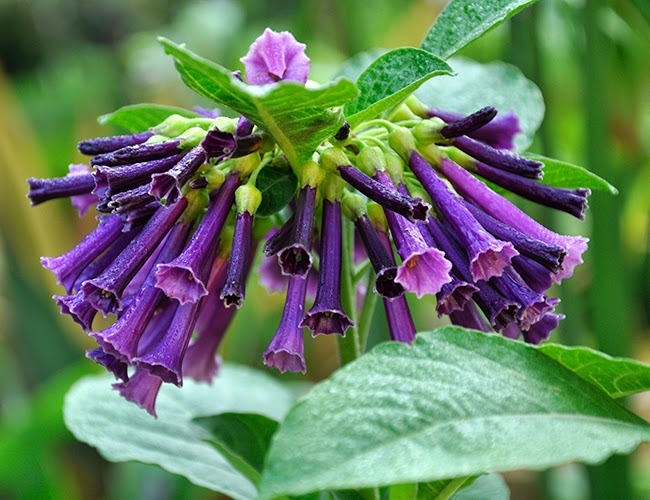 IOCHROMA FUSCHIOIDES 'ROYAL QUEEN', A SPECTACULAR TROPICAL SHRUB FOR A SUMMER CONTAINER IS ONE EXAMPLE OF WHAT YOU CAN ORDER ONLINE NOW, FOR POTTING UP IN MAY. 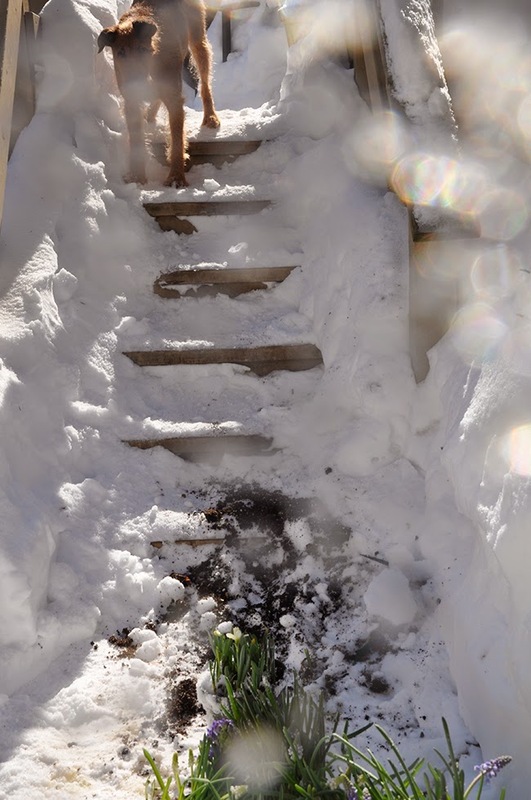 It's nearly April and we barely have anything in the garden that seems alive, there is still 1 - 2 feet of snow on the ground - I mean, even the witch hazel has yet to to bloom. Not a snowdrop to be seen, no crocus, not even an early blossom on the Cornus mas. To top this all off - it's been snowing for 8 hours now, but at least nothing is sticking. I might even go as far as to say that it looks pretty - maybe pretty, if this was November. 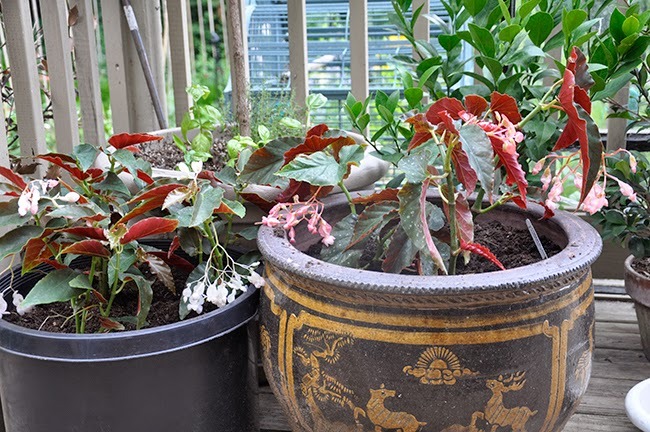 BEGONIAS OF ALL TYPE GROW QUICKLY AND CAN MAKE IMPRESSIVE SUMMER CONTAINERS. THESE CANE-TYPE OR ANGELWING BEGONIAS FROM LOGEE'S GREENHOUSES OR KARTUZ GREENHOUSES ARE BEST IF PLANTED 3 TO A LARGE POT - STAKE THEM AS THEY TOWER UP TO 4-5 FEET IN ONE SUMMER. I think I am kind of ready for spring. So why not spend some time ordering plants for summer containers, for the summer greenhouse and for the garden. Local garden centers seem to carry more and more big-brand selections, like Proven Winners and Monrovia Nurseries, which is great, since these are fully tested varieties, often selected for their vigor and overall performance, but if one wants something different or more unique, it will take a little more effort. 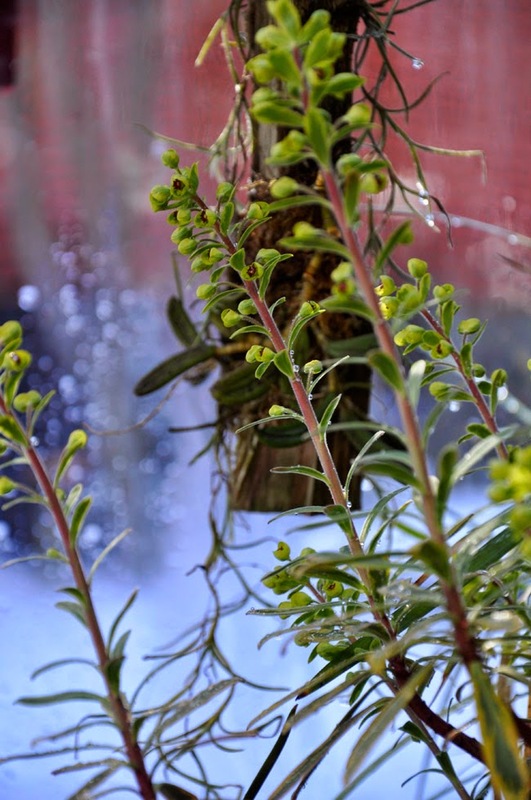 Here are some of my go-to sources on-line for interesting container plants which often cannot be found locally, as well as some sources for rare bulbs, herbs, shrubs and trees and tender plants which one might bring into a cellar, greenhouse or a cold cellar for the winter if you live where it gets cold and snowy. 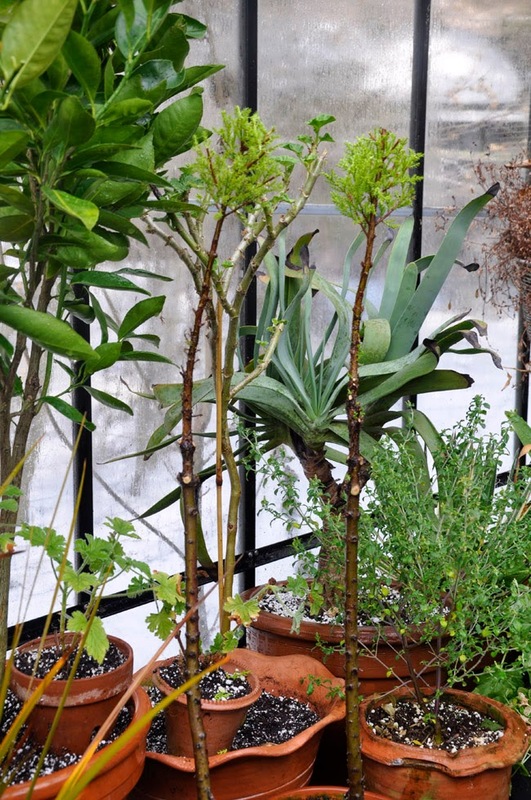 Perennial Euphorbia 'Ascot Rainbow' does make a good pot plant in a cold greenhouse. This one was a gift from the gal's at Blythewold Mansion two years ago. So little in the greenhouse looks good enough to photograph - I have no idea how I am going to rescue it for our garden party on May 1st. Fair warning - you may want to read this post first before you decide to vote this week for this blog as your most favorite gardening blog (it's in that pink circle ad up there on the right hand side column). I do hate asking folks to do things like that, but, after all, blogs are social media, and good ratings sometimes count. Really, I am not being negative, either. Gardening advice - beginners crave for guidance, experts seek new inspiration, and everyone else in-between just wants to loose themselves in some gorgeous imagery and text that will transport them into some fantastical garden in their mind. I've been wondering lately if all of the abundance of information - Facebook groups, blogs, magazines, tweets and gardening product companies just might be over-informing us? I'm not sure yet about Pinterest, as I too am addicted to it, but as many of you know, it too can be over-used, or at the very least - misused. I beg to ask the question - what is gardening today? I imagine that the answers can be many, a way to grow food, agriculture perhaps, potted plants and house plants certainly, but another definition might be emerging - that of gardening as a craft. A DIY craft project, which isn't necessarily a bad thing at all, as what's wrong with creative expression? Plus, a child making a fairie garden might one day discover that he or she has suddenly fallen in love with gardening. So what then is my concern? I'm sharing this curious vine which grows from a tuber with you all again as it continues to impress me, yet it remains rare in most collections. It's a tuberous Tropaeolum, which isn't botanically a nasturtiums but the genus for the common garden nasturtium is Tropaeolum. You may be able to identify some similar characteristics in the blossom - particularly the spur. Native to the Andes, the taxonomy of this particular species is as of yet, un clear - yet it looks very similar to one which was also grown at Kew Gardens identified as Tropaeolum x tenuirostre, but that is still under review by botanists. 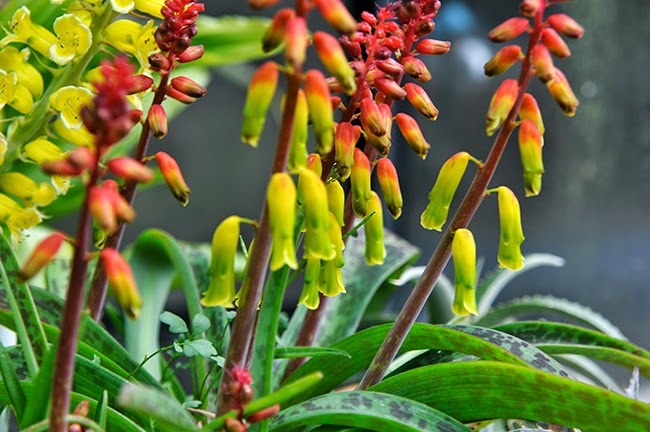 It may simply be a cross between two tuberous species, T. tricolor (tricolorum) and T. brachyceras. These tuberous nasturtiums are getting more attention today by enthnobotanists and science as the interest in finding more sustainable food crops grows. 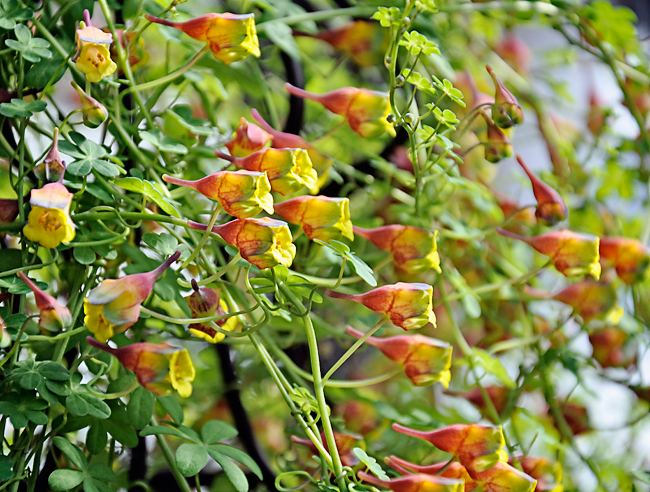 One tropaeolum is already under consideration as a greater food source (Tropaeolum tuberous) which is commonly grown by native populations in the high Andes (Bolivia, Ecuador. Chile and Peru) along with the other Andean tubers which include Oca (Oxalis tuberosum), potatoes (Solanum tuberosum, S. juzepczukii), Papalisa or Ullucu (Ullucus tuberosus) and of course, the afore mentioned Tropaeolum tuberosum, which is often called Isaño or Mashwa. Few flowers are as amazing as the Auricula primroses. Commonly referred to as 'auriculas' by collectors, the plant has a rich history full of drama and quirky tales, but most impressive is that the auricula was one of the first 'florist plants', the term 'florist' even came from those who carried these rare plants in England hundreds of years ago before people began growing plants in pots. We have much to owe to the auricula, but just try to find one to grow today. 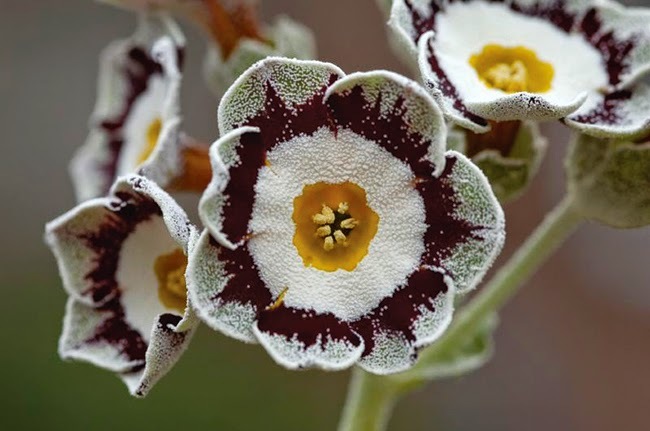 Captivating, beguiling, astounding - choose your adjective, the primrose known as the auricula, or Primula auricula (I am sure spellcheck has changed this to auricle at least 88 times within this post! 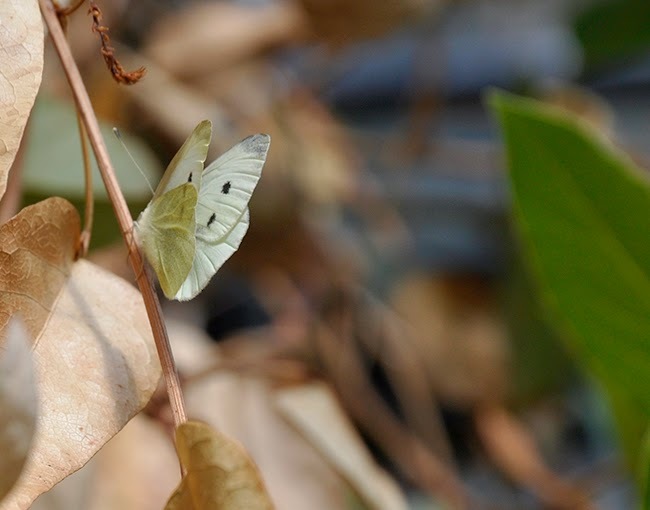 ), remain rarely seen in most American gardens - but why? Well, the reasons are many: First, auriculas may be gorgeous, but they are not the easiest of plants to grow well, (or even to grow poorly for that matter), second, much of the climate here in North America is terrible for these true alpines, as they are more used to conditions found in the high and dry snow covered Alps. So unless you live in Seattle, Vancouver or in Alaska, they are challenging to grow, to say the least. Thirdly, the Auricula demands precise alpine conditions which evolve into tasks required for each season. 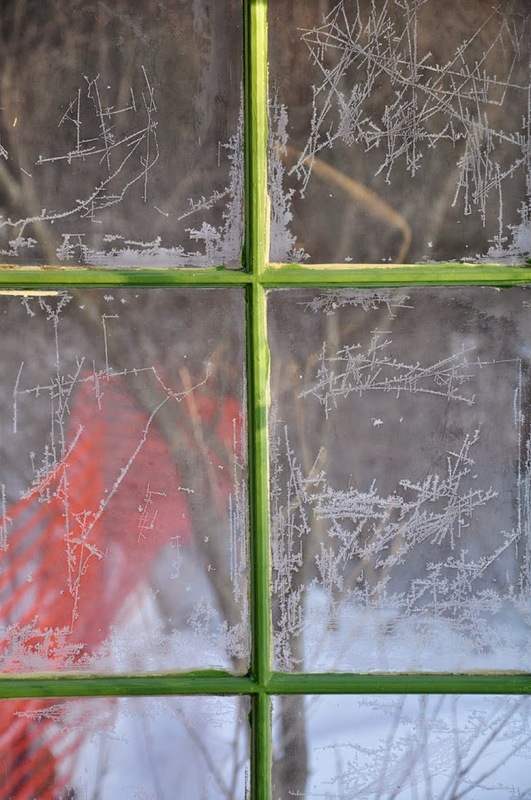 Although they are hardy to -30º, trying to keep them alive over winter requires more skill than simply being happy that one lives in a cold climate. Wild Primula auricula on the North Face(yeah, 'that' North Face), on the Eiger in the Bernese Alps of Switzerland from a trip I took there a couple of years ago. 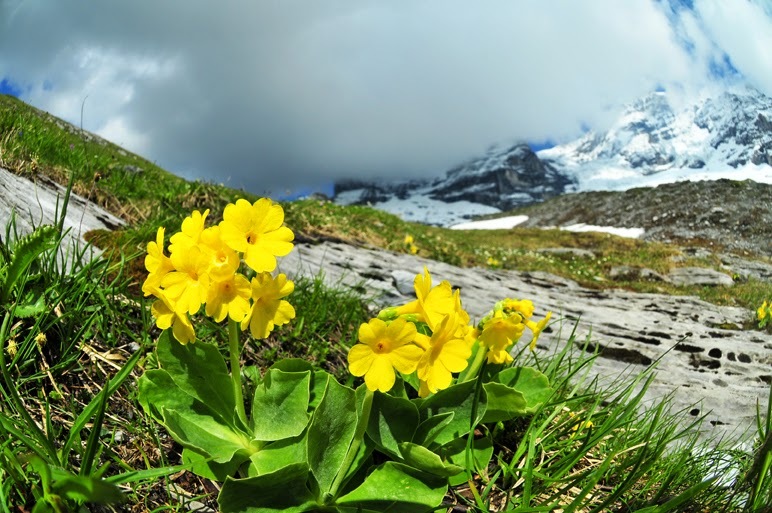 These plants were growing about 8,000 in a meadow only feet from the bottom of a glacier. Like many alpines, we can begin by looking at the wild species which themselves are notoriously fussy about all sorts of atmosphericy things - you know: billowing cold cloud mists at 9,000 feet, fresh glacial water rushing through the silty muck which they grow in, the perfect breezy, cold alpine meadow, and maybe a millimeter or 2 of Pika poop for bit of a snack - easy peasy if you live at a ski lodge high in the Alps, not so much if you live at sea level in Atlanta, or Boston for that matter. Still, the auricula captivates all who view them, and indeed, they can be 'growable' but many who live in the cooler parts of the country. I think that it's time for me to kick of some auricula appreciation time here, sharing with you not only how to grow them, but where to get some as well. It's been quite a week, and in an effort to move ahead, (thanks to all who shared condances about our dear Fergus), I was looking forward to a warm, sunny day in the greenhouse before moving on to catch up on the every-backing up daily chores like laundry, cleaning house, grocery shopping and working on some big presentations for work next week. 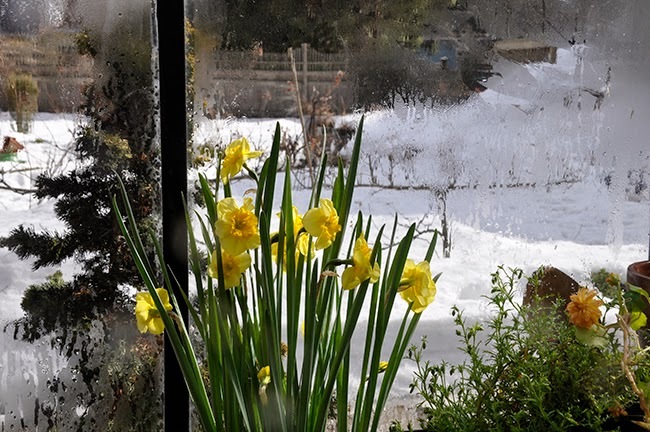 Aside from my every increasing duties as President of the North American Rock Garden Society, which includes a long list of to-do's I have yet to begin, I still took some personal time in the greenhouse - where even though it is still cold outside, and even snowing a bit today, the temperatures under glass neared 70º which felt like 80º to me. I STARTED FOCUSING ON THE READ SAND BENCH, CLEANING UP, CUTTING OUT OLD JASMINE VINES WHICH HAD FROZEN IN OUR DEEP FREEZE, WHICH IS SAD, BECAUSE THEY SHOULD BE IN BLOOM BY NOW, I HAVE DECIDED TO USE THIS BENCH FOR THOSE PLANTS THAT NEED PRUNING - TOPIARY AND THE LIKE. 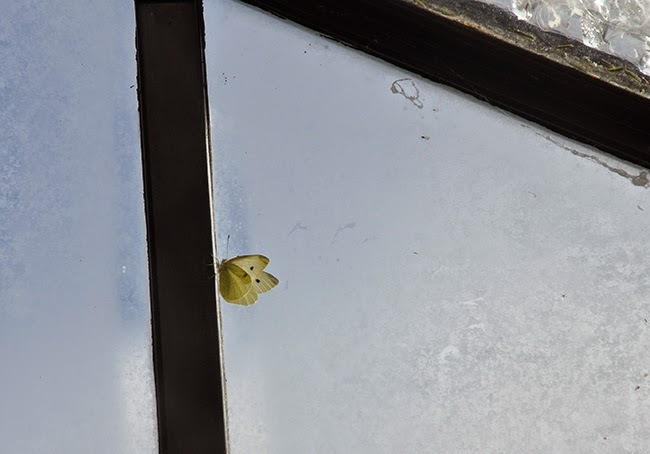 Click below for some random notes on far too many greenhouse chores! Who needs spring? FERGUS LOVED THE CAMERA - HE HAD THIS WAY OF LOOKING DEEP INTO THE LENS, AND YOUR SOUL. SO EXPRESSIVE, HIS IMAGE MADE IT ONTO THIS BLOG ALMOST IN EVERY POST. 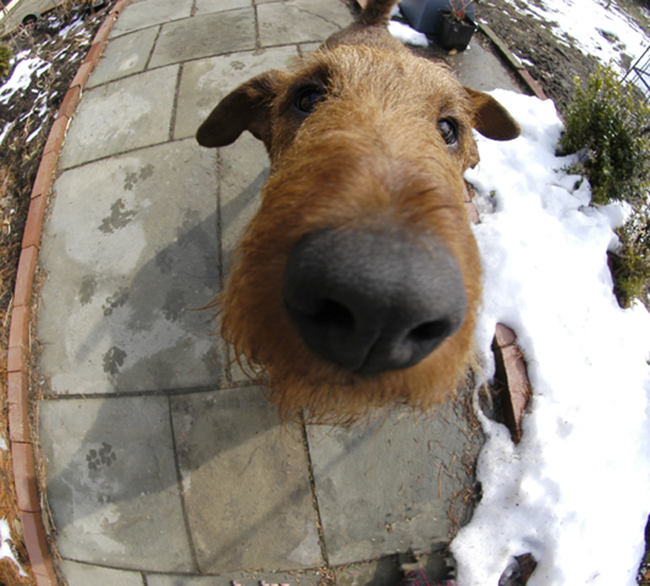 We lost Fergus today to Cancer, our 13 year old Irish Terrier who was naturally, what all great dogs are to gardeners - their best friend, the closest companion and intimate secret keeper. I know it means little to anyone outside of our inner circle, but to us - Fergus was so dear, and his loss is so painful, that I think I just need to do this obsessive post just to heal myself - to post zillion photos of him, and write random ramblings, if only so that I can move on. Bear with me, you don't need to read it. Click below for an insane amount of Fergie photos from over the years of him appearing on this blog.